Were we too late for the genuine experience? That was my immediate concern as we entered the golden center of Jakarta. 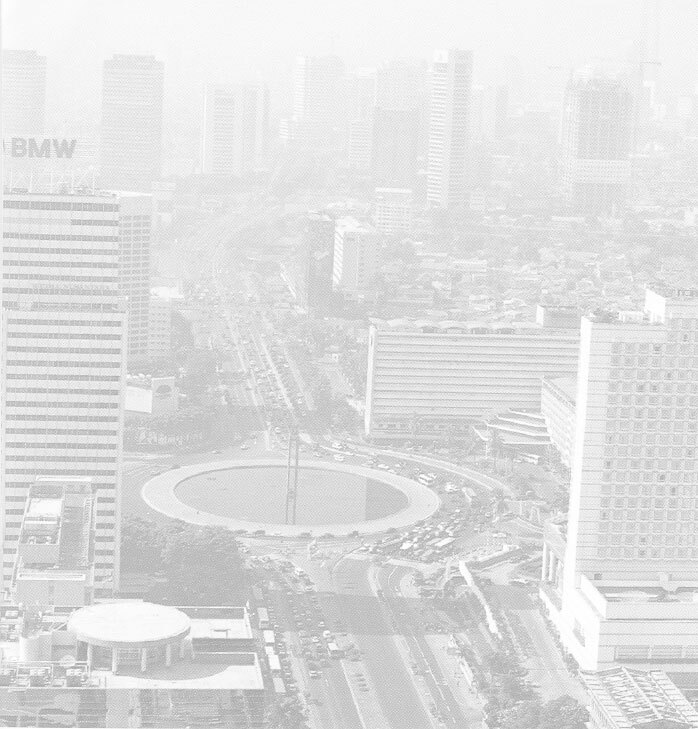 The global economic machine had spawned anonymous skyscrapers as far the the smog-stung eye could see. The Mandarin Hotel* (at the 10 o'clock position on this photo* of Friendship Circle) was a glitzy international class hotel where the men all wear suits and the women are petite and glamorous in coifed hair and high heels. Jim and I came dressed for third-world adventure -- baggy pants, jungle boots, and straw hats -- ever the gigantic American misfits. The scratchy gloom of jetlag settled over me. We had flown incalculable hours from Rochester to the West Coast to Japan to Singapore. We arrived after midnight in Singpore. Bunnie the travel agent had told us we should stay at the airport hotel "no problem" but it was full so we had to sleepwalk our way to someplace at the airport's edge. One more flight. The driver we'd booked through Bunnie to take us cross-country met us at the Jakarta airport. He spoke no English but managed to convey that he needed to be paid up front and in cash. How trusting must we be in our dazed condition? "Just go away," I tried to tell him. The Mandarin's glass and chrome must have convinced me we'd find a credit card alternative somewhere. But he waved his copy of the voucher at me -- a deal's a deal. We forked over the cash. I can't believe we didn't go right to bed, but Jim wanted to explore. In the tropics it is suddenly dark.We exited the hotel into the modern maelstrom of Friendship Circle and its 8 or 10 lanes of traffic. For all the glass and steel surrounding us, the sidewalk beneath our feet was all broken. Maybe you're expected to take a cab from one side of the circle to the other, who knows. We stumbled along. Was this the exotic city I'd hoped for? On the plane I'd begun reading The Year of Living Dangerously. 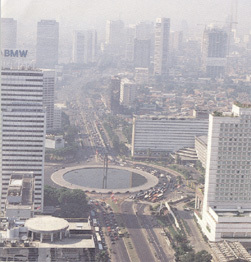 * Directly across from us (at 2 o'clock on the circle) was the Hotel Indonesia, the first air conditioned hotel in the country and the site for much of the novel, which is set in the 60's at the end of the Sukarno era. Back in those days, the transportation outside the hotel door was the betjak -- the foot-powered pedicab. The hotel looked dowdy now against the glitter of 90's Jakarta. We stumbled into traffic and battled our way across two of the arteries to a glitzy mall. The merchandise was as anonymous, as culture free as the skyscrapers: designer clothes, gold, gemstones. We're too late, I thought. There is no more Indonesia. It's all Los Angeles. We gave up our exploration and dodged cars back to the hotel and its KafeKafe restaurant. In the fog of jetlag and jangle of post-traffic trauma, the aromas of coconut and peanuts made me think there still might be something to look forward to. The Year of Living Dangerously by Christopher J. Koch, 1978.